Cleanse Day questions? We have answers! One of the most unique components of the scientifically validated Isagenix 30-Day System is nutritional cleansing or what Isagenix Customers know as Cleanse Days. While experienced cleansers already know the benefits of completing regular Cleanse Days, it can often be a tough concept to explain to newcomers. Cleanse Days aren’t complicated but for most people they are very different from a typical routine, leading to plenty of questions about cleansing. Here are some of the most frequently asked Cleanse Day questions, all answered in one place. Cleanse for Life™ is a synergistic blend formulated to nourish the body and support its own natural detoxification systems. The proprietary blend of botanical ingredients in Cleanse for Life includes aloe, peppermint, fennel, blueberry, raspberry, bilberry, turmeric, adaptogens and more. This combination of ingredients works to support the body’s natural detoxification pathways both on Cleanse Days and with daily use. An Isagenix Cleanse Day is a form of nutritionally-supported intermittent fasting. Intermittent fasting is an eating pattern that involves regular fasting days and draws from a growing body of research that supports the benefits of this lifestyle for weight loss, weight management and general health (1-2). Will Cleanse for Life help me lose weight? The Isagenix 30-Day System has been clinically tested to support weight loss through the combination of a calorie-controlled diet on Shake Days and nutritionally-supported fasting on Cleanse Days. 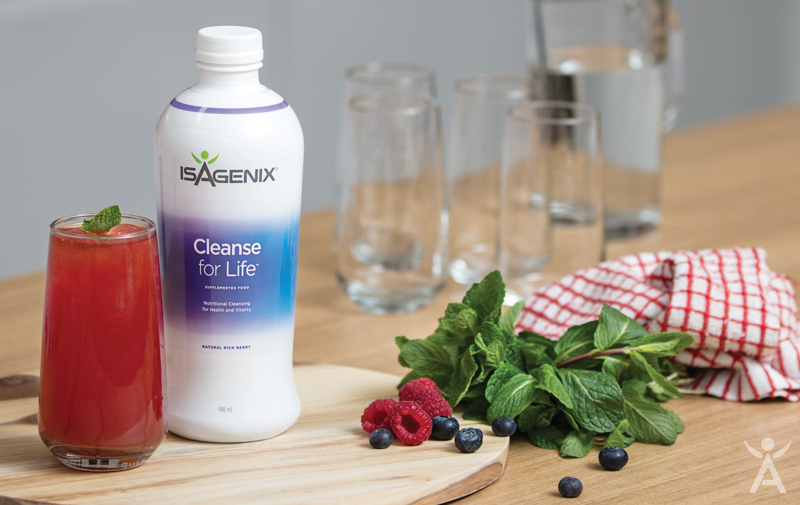 Cleanse for Life is an essential component of an Isagenix Cleanse Day and can contribute to helping you achieve your health and weight-loss goals when used as part of an Isagenix System. Will I feel hungry all day? Won’t I just overeat the next day? It’s common for cleansers to report that their appetite seems more manageable following a Cleanse Day. This surprising benefit of fasting has attracted the attention of researchers, leading to recent scientific studies exploring how intermittent fasting could help manage appetite. Researchers at the University of Illinois at Chicago conducted a 10-week study to evaluate the effects of intermittent fasting during weight loss on hunger, fullness and appetite-regulating hormones. Surprisingly, the study participants did not experience the expected increase in hunger that is common during weight loss and they also reported feeling greater levels of fullness and satisfaction after meals on non-fasting days (3). These results suggest that intermittent fasting may help support appetite management. Should I cleanse one or two days? What about daily cleansing? Nutritional cleansing with Isagenix is flexible and can be adapted to fit many lifestyle and health goals. Benefits can be seen whether you choose one or two Cleanse Days per week. For those who are new to Cleanse Days, it’s best to start with one day, but you also have the option of cleansing for up to two consecutive days per week. With both schedule options, you may cleanse up to a total of four days per month. If you don’t feel ready to complete a full Cleanse Day, you might choose to gradually ease into cleansing by trying a shortened ‘mini cleanse’ of 12-16 hours to help build your confidence. Try different patterns to find what works best for you, but be sure to follow the guidelines in the Weight Loss System Guide. Daily cleansing is a great option for those who choose not to complete full Cleanse Days but would still like to receive the nutritional benefits from the proprietary blend of botanical ingredients in Cleanse for Life. The guideline for daily cleansing is to drink one serving of Cleanse for Life first thing in the morning, although you can enjoy Cleanse for Life at any time of day. Nutritionally-supported fasting through regular Cleanse Days can offer important benefits for your overall well-being and help you to reach your health and weight loss goals. Cleansing can sometimes seem like a tricky concept to explain but remember that Cleanse Days are flexible if you keep the general guidelines in mind. 1 Li Z, He F, Tinsley GM, Pannell BK, Ward E, and Arciero PJ. Comparison of high-protein, intermittent-fasting low-calorie diet and heart healthy diet for vascular health of the obese.Front Physiol 2016 Aug;7(350). 2 Trepanowski JF, Kroeger CM, Barnosky A, Klempel MC, Bhutani S, Hoddy KK, Gabel K, Freels S, Rigdon J, Rood J, Ravussin E, and Varady KA. Effect of alternate-day fasting on weight loss, weight maintenance, and cardioprotection among metabolically healthy obese adults: a randomized clinical trial. JAMA Intern Med. 2017 Jul 1;177(7):930-938. doi: 10.1001/jamainternmed.2017.0936. 3 Hoddy KK, Gibbons C, Kroeger CM, Trepanowski JF, Barnosky A, Bhutani S, Gabel K, Finlayson G, Varady KA. Changes in hunger and fullness in relation to gut peptides before and after 8 weeks of alternate day fasting. Clin Nutr. 2016 Dec;35(6):1380-1385. doi: 10.1016/j.clnu.2016.03.011. Weight-loss results depicted here should not be construed as typical or average. In a study performed in 2012 by University at Chicago researchers, subjects lost an average of 4.1 kg with an average of 0.9 kg of the loss from visceral fat after 30 days on an Isagenix System. The subjects also had a greater level of adherence and had more consistent weight loss from week to week compared to subjects on a traditional diet. Always consult your GP before making any dietary changes or starting any nutrition, weight-loss or exercise program. If you are pregnant, breastfeeding, diabetic, on medication, have a medical condition or are beginning a weight loss program, consult your GP before using Isagenix products or making any other dietary changes. Discontinue use if adverse event occur.